Demon Gate is a dark fantasy role-playing game written by Brandon Williams and published by Arcanum Syndicate. Demon Gate is a standalone dark fantasy RPG that appears to blend elements of Dungeons & Dragons, Pathfinder, and Legend with an apocalyptic setting and mechanics turned up to absolutely epic levels. When you get to the nitty gritty, it’s designed much like a MMORPG where the action and excitement doesn’t stop until you reach level 1,000 (although no, there are not 1,000 levels in Demon Gate). And while this may seem like a bit much, it’s a good thing the game starts low and goes to demigod levels as the setting scales from the lowest minions to battling divine-like demons. So yeah, you need all those levels (there’s actually 100 of them), otherwise how are you going to stop the apocalyptic event from happening?! You might be thinking that Demon Gate is another vanilla fantasy RPG that plays much like its predecessors; but it’s not. It is alike because it uses a Race-Class-Level system like many vanilla fantasy RPGs. It also has a magic system where every spellcasting class has its own collection of level-based spells to choose from. As for combat, it’s a bit more gritty like Legend is. But that’s not really what stands out. 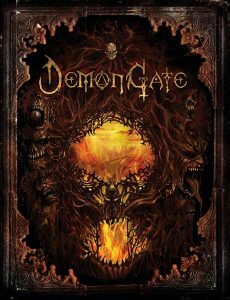 What stands out and sets Demon Gate apart from the others is that the setting is ingrained in the mechanics. First, each character race is not there because it fits into vanilla fantasy; they are there because they are an integral part of the setting’s canon. Second, each character race has a detailed set of beliefs unique to that race and again an integral part of the setting’s canon. Third, the character-leveling system is such that it scales from the lowest form of minion up to the devastating might of the most powerful demons. Again, this is an integral part of the setting’s canon and is an integral part of the lore surrounding the demon gate (which I won’t divulge here). Characters aren’t the only tie between mechanics and setting. Many vanilla fantasy RPGs either have a generic bestiary collection that leaves the GM to decide why each one exists. Otherwise you need a campaign setting guide to define a setting-appropriate bestiary and why they exist. 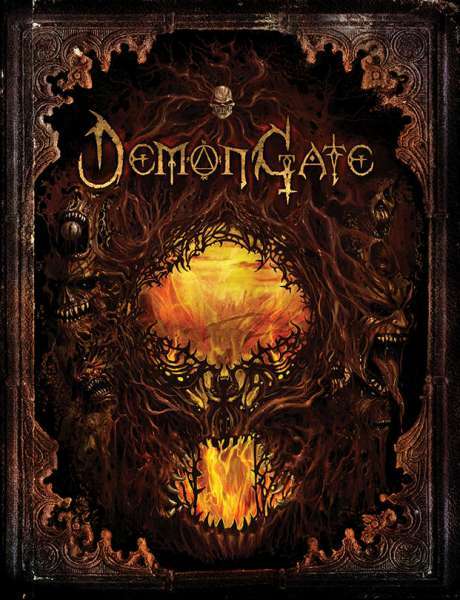 For Demon Gate, you get that campaign setting guide in the core rulebook with a bestiary collection that not only matches the dark fantasy theme, it also matches the lore, setting, and the demon gate. Topping this all off is a lengthy gazetteer that provides you with that campaign setting guide right in the core rulebook. But what about gameplay? The setting is dark fantasy, but it’s not constant-in-your-face dark fantasy. Rather, it’s a gradual-build-up dark fantasy where the PCs may know there’s something bad looming on the horizon, but it doesn’t look that way until they get closer and closer to what’s really going on. Then things go from meh to bad to worse. That’s where the dark fantasy aspects come in and that’s why the game is described as apocalyptic dark fantasy – it’s a build-up like an incoming apocalyptic event. Enough about the game though, what about the book? I’m going to be honest… I’ve seen many Kickstarter campaigns that fund RPGs that turn out looking great, but are written or edited very poorly. 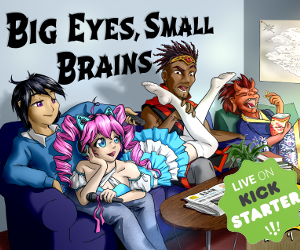 I’ve also seen Kickstarters that produce books that look terrible despite having cool artwork and okay writing. I’ve also seen Kickstarter that produce garbage. Demon Gate is none of those. It has good writing, awesome artwork, and beautiful graphic design. The book flows very well from beginning to end and is extremely easy to follow. It felt very much like a professional book, just like those aforementioned ones. But the cover? Seriously; this cover is amazing! It’s so frickin’ cool! But then, I’m a fan of horror-infused RPGs like dark fantasy.